"I purchased my Willy Dog "Hummer" cart this summer and it exceeded my expectations. Lisa and all the staff at Willy Dog was very helpful and responsive. My new business has taken off very well and Willy Dog has been a big part of our success. Thank you!" "I was actually going to email yourself and Will yesterday to let you know how great this new umbrella is. Even 40 mph trade wind gusts don't budge it and now my customers don't have too hold the umbrella when we dress their dogs. Sales are growing here and we desperately need a 3rd unit. We have hired some help and are ready to take another small step forward. We could place a 3rd unit and staff it immediately. we signed a long-term partnership/leasing agreement last week with the 3rd largest bank in Hawaii giving us access too all of their branches for locations and today I received a call from the manager of Sam's Club/Wal-Mart interested in a similar agreement. Hope all is well with you and family Lisa. Again, thank-you for your excellent client service!! PS - Are you able too send new pins for the door hinges on the carts and tubing/hoses for replacement on our steamer unit? We have 'spot-welder’s the door to the hinge temporarily until we can insert a new pin." Aloha, and thank you for the follow up. "We were invited too vend for the 4th of July at Maunalua Bay here and I wanted to let you know how it went! It was our first major event. - 5000 people attended this event and we had a week prior of free radio and newspaper advertising. We paid $270 to participate. - We were THE BUSIEST vendor at the event. - We brought both Willy Dog carts. The BBQ we used for Corn Dogs and they steamer unit for Jumbo Hotdogs. - We sold 300 Hotdogs in 5 hours @ $5.00/ea. My back is still sore. - We were lined up 10-15 deep for 2 hours between 6:00pm & 8:00pm. Great event! Including chips/drinks/ & potato salad, we made over $2000 in the 5 hours we were there. Great margins. A few pics attached. The rest of the pics and video from the event are on our Facebook page. Hope things find you well. PS - Our THIRD location is a smashing success and we will be placing an order for an additional cart in the next 60 days. " "Wanted to give you guy's an update on how things are going, we are taking it easy and didn't start business last summer with the Willy Doggy Cart so that we have more time to work on the image and find the best location, we will most likely open for Easter 2011, I got someone to design a logo for the business witch I called Mr. Hot Dog (not very original name I guess!) we started a Website www.mrhotdog.es and are working on getting all beef hot dog's to get the real American taste. I think it's important to have a good image, because on the long run if the first location works, we will definitely open more locations. 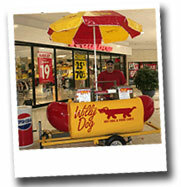 I do have to say everyone who has seen the Willy Dog Cart love's it and have never seen something like it. Once we have the exact location I will let you know in case you every drop by in Spain, any of you get a free Hot Dog (drink NOT included got to make a $!! lol) "
"I just wanted to send my gratitude to you and your team for they fine job on my Hummer cart. It has proven durable on the highway, and reliable working the sidewalk. I receive compliments almost daily on it’s attractive and professional appearance. Starting a business is not easily but my cart has fortunately been something I don't have to worry about." "Please forward this email to Will as well since I don’t have his email specifically. Many thanks for kind, fun and fruitful meeting! I and Mrs. L really enjoyed our too short visit in Canada and can just say that we are really triggered to get this thing moving asap so we have an "excuse" of returning soon! I think Canada is a great country and we love to see more! Not only is business the exchange of money and goods. I have done that enough many times in my life to know all the routines about that. But the fun of trade and contacts is when you meet some great personalities and devoted entrepreneurs! Such as yourself! That is refreshing - and a lot of fun! I take my hat off for your business and many great ideas and solutions. Trust me - I don’t say that to everyone.... "
"I send you pictures of are first day vending hotdogs in Maastricht, The Netherlands. The Hummer from your company is really great!" "Super people to deal with. All very professional. I do believe they had our best interests in mind. We were happy to BUY our cart from them, and are doing well!. (McWeenies Gourmet Hot Dogs)"
"Wow! From start to finish Lisa and the folks at Willy dog were awesome. I wanted lots of custom features and they built my dream cart. They kept me up to date on my build, delivery was seamless and my son and I were in business two days after receiving our cart." "I am writing to thank you for manufacturing the Willy Dog cart. It is such a head-turner! There is always a smile on people’s faces when they see it. It’s not just an easy handling, spacious and well-designed hot dog cart but it is its own advertising. Our Willy Dog cart is a huge hit; anywhere we take it…people come running (and not just for the hot dogs)!! I have had children, teens and families do selfies with my Willy Dog cart. I even had a police officer stop me one day to ask if I could participate in one of their community events! Our hot dog project “Give A Dog” was started to feed needy children and others who are hunger in our community twice a month. We go to parks, non-prophet agencies, low-income apartments and shelters to give free lunches to children and others. We started out doing free hot dog lunches twice a month in 2016 and so far in 2017 we’ve already scheduled weekly events for most of the summer and early fall. When we do an event we send volunteers into the neighborhoods with door hangers (to invite children) with the line: “To find us just follow the yard signs and look for the big hot dog on wheels”; and the kids come running! We’re now expanding because we’ve been asked to do some smaller indoor events (homeless, women and family shelters, the Ronald McDonald House and job training programs); so we are ordering the “Wee Willy” and “Super Wee Willy”; we think they will be perfect for those indoor events and a lot of fun too! Thank you for your creative and useful products and communication with Lisa has always been a delight and very helpful!" “Sonya here. I have been operating my hot dog cart in downtown Oshawa for over a month now and the community has truly received me well! They love the quality of service and definitely the quality of my products. There have been several questions and discussions pertaining to my cart. People have asked me where it was purchased, and numerous discussions have occurred regarding its uniqueness and workmanship. Your ears should be ringing because I am always talking about you and your amazing staff who have served me well. One fellow took pictures of your tag on the cart as he stated his intentions to contact your company. I received nothing but love and support from you guys, and for that I am truly grateful!! I look forward to a long lasting relationship with your team.” Pat yourselves on the back!! "I want to thank you for your great customer service. We strive to do the same. I have been in current location for 16 years now and it gets very windy at times. If you are at Pittsburgh please stop by for lunch some times." 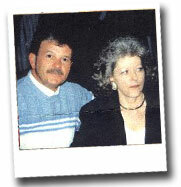 "This is a particulary rewarding experience from a couple who started their hot dog cart business together. (You would almost think we paid them to write this! But it was unsolicited.) Thanks for the feedback and best wishes for continued success!" I will try to be brief here but wanted to share our story for those who may be thinking of this business but can't make up their minds. David was working in the car business and had been since 1989, he was making somewhere in the neighborhood of 60-70K a yr. He moved around some as most car business people will for various reasons mostly more money. Well I won't go on & on but his job was basically eliminated . I worked for a company was an Investigative Analyst making approx 30-35K when due to some health problems had to take a leave of absence and doctors were saying I probably would not be able to return. So here we are with a mortgage and lots of other obligations now what? We started to talking about this business and years ago I had expressed to David I wished there was some place here in town to get a decent hot dog. I told him I wish we had the money to open a shop and sell nothing but good hot dogs. Rent and expenses for a shop was not anywhere in our budget. (It is almost like if you will build it, they will come) for lack of a better term. We started checking out web sites and collecting information on how to get started and what it would cost us to get this going. So we raked and scraped borrowed enough to buy our first hot dog cart. OUR HUMMER FROM WILLY DOG. There are companies in the US that sell these carts & we have seen them and they way they are constructed and if you are thinking about buying one DON'T!!!!!!! !We got health inspected, business license, permits and Insurance and begin to look for locations. It was a lot of work but believe you me that in the long run it will pay off because you will as we did run across people with out business license and insurance and they complain because they can't get into the business districts. THIS IS WHY. They do not operate this like a business and if you want to succeed you must treat it like it is your living because it can be & should be & it is ours. Our first day we sold 2 hot dogs LOL and a few drinks. David come home saying I sure hope things pick up LOL. Next day a few more dogs and on & on & on. Sales have continued to build and our business is going so well if we had more carts they all would be busy. Can Drinks $1.00, Chips $1.00, Large Kosher Pickles $1.00, we carry a special soda JONES SODA ( made in your part of the country I think) $2.00, on occ we will sell brownies $1.00 & yes even Gummy Bears $1.00 usually when there will be children but hey you would be surprised adults like Gummy Bears. One big thing is only buy small quanity until you see how it moves. Sometimes things move faster than others depending on the crowd. One other thing is keep it as simple as possible do not try to sell too many things. We plan to add coffee & coco this cold season and see how it moves. Our story is probably like many others, do what works for you but remember. WINNERS NEVER QUIT & QUITTERS NEVER WIN. Will at Willy Dog is the only guy we will buy from. He has always answered our questions and always been honest and is professional and does what he says he will do. Our cart got wrecked and we just ordered a replacement from Will and when we get things rolling we plan to buy others. ONLY A WILLY CART!!! Here's a letter we received from some happy customers who purchased a Willy Dog hot dog cart , picked it up at our New York facility and drove it back home to Chicago. My wife and I purchased a cart from your company last month. I searched the Internet for a cart that I would enjoy using, and your cart caught my attention immediately. I had never met you, nor have I ever seen one of your food carts in person. After speaking with you and Ron in your office on numerous occasions, my wife and I both felt confident that we made the right decision to purchase a Willy Dog Cart. As we had plans to start our business the day after Thanksgiving in one of Chicago's south suburban malls, my wife and I decided to travel up through Canada to pick up our new custom made cart. Both Rick and Cory at your distribution site in Alexandria Bay, New York made sure that the cart and trailer were well secured to our vehicle for the return trip. We were a long way from home, didn't know anyone, and couldn't be happier with the way Rick and Cory helped us. They went overboard to assist us in making the long trip home safely. Both men are great representatives of your company's support staff and you should be very proud of them. Thankfully, we arrived back in Chicago after numerous snow storms and high winds without any damage to the cart. We couldn't be more pleased with the quality and it has everything we need to sell our product efficiently. The cart attracts customers of all ages and business has been brisk. Thank you so much for making this the cart of an enjoyable new venture. I have enclosed a picture of our new Willy Dog cart with my wife and me proudly standing behind it. I want to take this opportunity to thank you for giving us the chance to become Willydog franchise owners, and to become the first Willydog franchise in British Columbia. What a great summer we’ve had! Met lots of people. Enjoyed the outdoors, had fun and earned a good living at the same time! My husband and I are so pleased with our decision to become Willydog franchise owners. Our only disappointment was that the business is seasonal. However, we’re hoping to change that. If things work out we may be able to “Willydog” all year long by moving inside the Canadian Tire store for the winter. Plans are in the making. If it is a go ahead, you’ll be the first to know as we’ll be ordering a 2nd cart (modified with a roller grill for indoors of course). Thanks again for giving us this opportunity – it was the best financial decision we ever made. I quit my day job (in a Doctor’s office) within 3 weeks of starting our business. You know what people in Fort St. John are saying? “Willydog rocks!”, “The hot dogs are willy willy good”, “Your cart is so eye catching and cute”. We’ve had a very positive response to our business and you have been very helpful along the way and we appreciate you returning our phone calls so promptly. Here's an experience from the Martin family. It brings us great pride to hear of a family success story. Just thought I’d drop you a line to let you know how much my wife and I have enjoyed doing business with you. When Angela and I decided to try something on the side, we looked high and low for something we both could enjoy. When I came across you’re a in one of the local newspapers we knew we had to get in touch with you. After meeting with you and discussing the opportunities and details, we were more than anxious to get going. Willydog had everything we were looking for: the ability to be our own boss, the ability to dictate our own hours, involvement in the community, and most importantly, being able to spend time together in a fun, relaxed environment. In closing, I would like to say that being a part of the Willydog team has been a most enjoyable and rewarding experience.